Author Gay Talese schmoozed with the crowd at the BPC fundraiser Sept. 15. 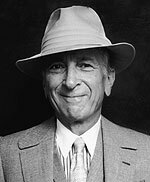 The Sept. 15 fundraiser with author Gay Talese was a big success, raising about $1,000 (early estimate) for the Bloomington Press Club scholarship fund. Attendees, including press club members, guests and some journalism students, chatted with Talese as they enjoyed wine and hors d’oeuvres on the stage at the Buskirk-Chumley Theater before the author’s lecture to the public. Talese was the first speaker of the IU School of Journalism’s Speaker Series. He is author of many magazine and newspaper pieces as well as best-sellers Unto the Sons, Honor Thy Father and Thy Neighbor’s Wife, among others. This entry was posted on Sunday, October 31st, 2010 at 5:51 pm and is filed under Guest speakers, Special Events. You can follow any responses to this entry through the RSS 2.0 feed. Both comments and pings are currently closed.